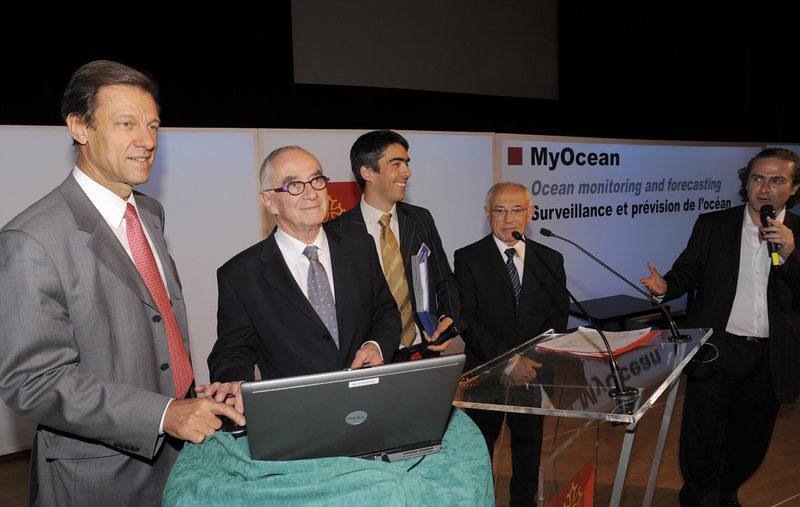 Mercator Ocean and the Midi-Pyrenees regional council recently launched the 1st European ocean monitoring and forecasting system that will provide a free service to give European citizens everywhere sea-state information at all times. Reinhard Schulte-Braucks, European Commission; Martin Malvy, President of the Midi-Pyrenees regional council; Pierre Bahurel, MyOcean coordinator, and Alain Beneteau, regional council Vice-President in charge of research, in Toulouse. Credits: MyOcean. Whether for guiding ships off the coast of Malta or monitoring Arctic ice, the MyOcean project is intended to supply sea-state information from the surface to the ocean floor. “The contract with the European Commission has been signed and we’re ready to start,” said Pierre Bahurel on 1 April, kicking off the operation in Toulouse, France. The director of Mercator Ocean* will be coordinating MyOcean as part of the European GMES** project. “For 3 years, 350 European experts in oceanography data analysis and processing will be working together to make this service fully operational by 2012,” says Bahurel. The ultimate objective is to provide European users with global oceanography bulletins - a kind of “ocean weather forecast” - like those Mercator Ocean has been generating and posting on its website*** since 2005. Du guidage des navires au large de l’île de Malte à la surveillance des glaces en Arctique, le projet MyOcean doit fournir des informations sur l’état des eaux de la surface jusqu’au fond des océans. Typical real-time analysis of the ocean supplied by Mercator Ocean since 2005. Here, the parameter measured is global surface-water salinity on 15 April 2009. Credits: Mercator Ocean. “The field of applications is huge, spanning research, professional, civil or military and global or local uses,” says Pierre Bahurel. MyOcean’s 29 partner nations have formed a network of 12 oceanography data centres. Like Mercator Ocean now, the system will depend on data collected directly in situ and from satellites. These data will be fed into numerical prediction models to generate real-time analyses and 2-week ocean forecast bulletins. * A public interest grouping based in Toulouse. CNES has been a member since the grouping was founded in 2002.